“This is a moment for Harvard to say that the digital humanities are important,” said Odile Harter, an organizer of the event and a research librarian. The concept of digital humanities is about bringing as much life to the study of human culture as there is culture of humanity itself. Through sound, images, video, and the immense body of data collected every day describing the footprint of life, researchers, scholars, and students are exploring unconventional ways to tell the story of humankind. More than 80 people gathered at the Gutman Library on Saturday to participate in Harvard’s first THATCamp, a free-form “unconvention” designed to inspire fresh conversation and ideas about the developing tide of digital humanities. THATCamp is an acronym for “The Humanities and Technology Camp.” The event was characterized more by what it was not than by what it was. It was not a conference, symposium, or convention with a full complement of lectures, papers, and PowerPoint presentations. It was a gathering where everyone was a participant in spontaneous discussion. Participants voted on what they wanted to discuss and then gathered to talk. When the day was done, the hope was that participants would leave inspired, more educated, and with an expanded network of people to help advance their projects. THATCamps have taken place in the Boston area, across the country, and around the world. The concept was developed in 2008 at the Center for History and New Media at George Mason University in Fairfax, Va., to bring humanities professionals and technologists together to jump-start the use of digital media and computing in the research and teaching of humanities. Martin Schreiner, an organizer of the local camp and the head of the Harvard Libraries maps, media, data, and government information department, said the dynamic of humanities research is steadily changing. New technology and the Internet are creating ways to conduct and present research for students and scholars alike. P.J. Neal is entering the final year of his graduate work at the Harvard Extension School. His thesis deals with the relationship between Harvard and the military during World War II. He came to THATCamp looking for ideas about how to present his research using digital media. Kelly Fitzpatrick, a graduate student at Simmons College, was introduced to digital humanities while working on her undergraduate thesis at Hampshire College. She created a website of digitized photos and print media from World War I. She then used an interface to deconstruct and analyze the material around the theme of her research. “In the past two years, I feel that digital humanities has really taken off as a thing that people are recognizing as unique,” Fitzpatrick said. 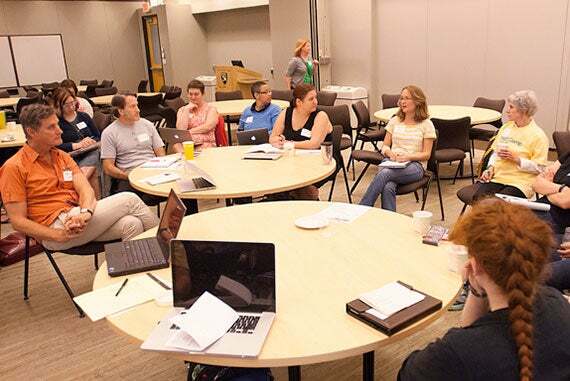 There were a dozen sessions Saturday that included discussions about building collaborations, introducing digital media to students and educators, improving accessibility and usability of digital archives, the use of digital media in academic storytelling, and the use of maps and geographic data. But a question underlying many of the sessions was the acceptability of digital humanities as scholarly work. THATCamp at Harvard was sponsored by Research Computing for the Arts and Humanities, the Harvard College Library, the Harvard Graduate School of Education, the Harvard Library, and the Northeast Regional Computing Group, and organized by the Digital Futures Consortium at Harvard. “Everyone in the design community was galvanized by Sandy and we absolutely need to work on coastal solutions, but we also have to be mindful that sea level isn’t the only threat,” said Joyce Klein Rosenthal, an assistant professor of urban design, who says that heat waves also have deadly potential.